Silver-anodized aluminium shell reinforced by magnesium alloy frame Alienware 17 ALW17-8752sLV is an eye-catching 17 inch gaming laptop that is loaded with the power of high end Haswell i7 processor to bring you the best of speed and performance along with great graphics for multimedia and gaming with a unique new “Tron” like design with angled sides and front, Full HD screen with superb anti-glare imagery, beautiful sound and more. 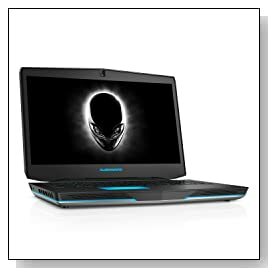 Alienware 17 ALW17-8752sLV comes with the 4th generation quad core Intel i7-4710MQ processor (6MB cache) with 2.5 to 3.5GHz speed with turbo boost and hyper threading (4 cores to handle 8 threads), 16 GB DDR3L SDRAM for superior multitasking, 1TB SATA 6Gb/s at 5400rpm rotating speed plus 80GB mSATA Solid State Drive caching and Windows 8.1 operating system. You will not have any problems with even the most demanding programs or games and multitasking will be super smooth. Windows 8 is the weakest link here but that’s what most modern laptops have these days and you get used to it in no time. 17-Inch anti-glare Active Matrix TFT Color LCD Full HD screen with 1920x1080 pixels max resolution and GeForce GTX 880M with 8GB RAM (there is no info online about the GPU of the 8752sLV model, the 8751sLV has this GTX 880M GPU) and the integrated Intel HD Graphics 4600 that is about 30% faster than the Intel HD 4000 in games and up to 60% faster in general multimedia. You have NVIDIA’s super fast FXAA antialiasing for better picture and performance, PhysX for dynamic and interactive more life-like gaming and Adaptive Vertical Sync to avoid image tearing. Sound quality is awesome with Klipsch certified speakers and Dolby Home Theater v4 with simple control panel for both immersive gaming and multimedia. You can even connect to a 3D large screen HDTV with the HDMI port provided. Solid anodised aluminium shell reinforced by a magnesium-alloy frame protects both the internal components and offers durability overall and this laptop has a great unique cutting-edge design with angled side walls and front, giving it a rather premium gaming machine look. It weighs 9.2 pounds, measures 11.77 x 16.28 x 1.28 inches so it is neither lightweight nor super slim or compact so it is more like a desktop replacement 17 incher gaming PC but offers you all the power, performance, features and specs you need for the best of gaming. It has a backlit- AlienFX illuminated keyboard with game functions and has an 8-cell lithium ion (86 wHr) battery to game longer as well as a wide range of connectivity options including Slot-Loading 8x SuperMulti Drive (DVDR/RW), Broadcom 4352 802.11 ac 2x2 wireless, Bluetooth 4.0, Ethernet port with RJ-45, 4 x USB 3.0 ports, 9-in-1 Media Card Reader, an HDMI port, audio jacks and Security lock slot. 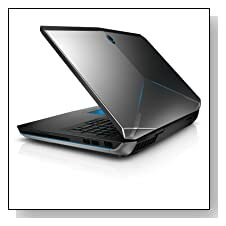 Conclusion: Alienware 17 ALW17-8752sLV has the latest technology of everything for way better than average- high end performance and speed. We love the large 17 inch Full HD screen and amazing surround sound, how good the keyboard looks and would feel, how smoothly the games would run with the power of NVIDIA GPU, snappy performance of SSD and large storage and memory, its 8-cell battery and more. There is not much wrong with this computer except for the not so cheap price tag. You will find the power cord, AC Adapter, 8-cell li-on battery and a 12 month In-Home warranty by Dell (including In-Home service following a remote diagnosis + 24/7 great customer support) inside the pack plus the trial version of Microsoft Office so although it is a computer designed mainly with advanced gamers in mind, it will handle any of the daily work or school related tasks super smoothly and efficiently. This is a great computer to consider if you want something super solid with quality components, that does the job and looks the part with its beautiful design and sure is worth every cent.